It’s been well over three years since we’ve taken a look at an Antec chassis, so we’re glad to have a new one on the testbench to take a look at: P70. Priced at around $70, this is an affordable mid-tower, and it has some attractive styling to boot. But does it live up to the pedigree we’ve come to expect from Antec? There’s only one way to find out. I’ve often made comparisons between PC chassis and automobiles. As spurious as the relationship might seem to be, I think they actually do share much in common. Take, as an example, one of my more recent review subjects. Because it is such a great synergy of style and design, a near-perfect blend of art and engineering, I see it as something akin to a supercar, something like the McLaren 675LT. But not every car – nor every PC chassis – is that special. Far more common are utilitarian cars such as a Ford Focus or a Toyota Corolla. Ford, Toyota and their competitors spend billions annually to win this segment of the market. Similarly, the PC chassis market is bursting at the seams with no-frills products, and this is where chassis manufacturers compete hardest for your dollars. So while top-tier products grab all the headlines and get all the love, the more common products have one big job, and that is to work properly and reliably. Fail at that, and you won’t sell a thing. That’s just how things work in a world where sheer volume sales determine whether or not a product is successful. Viewed in that context, Antec’s P70 is actually a very important product. It’s not a top-tier showstopper, but it occupies that portion of the market where builders get what are often their first impressions about a company and its products and design philosophies. If the P70 has any glaring problems, it becomes the proverbial albatross around Antec’s neck. Let’s have a look at the P70, then, shall we? 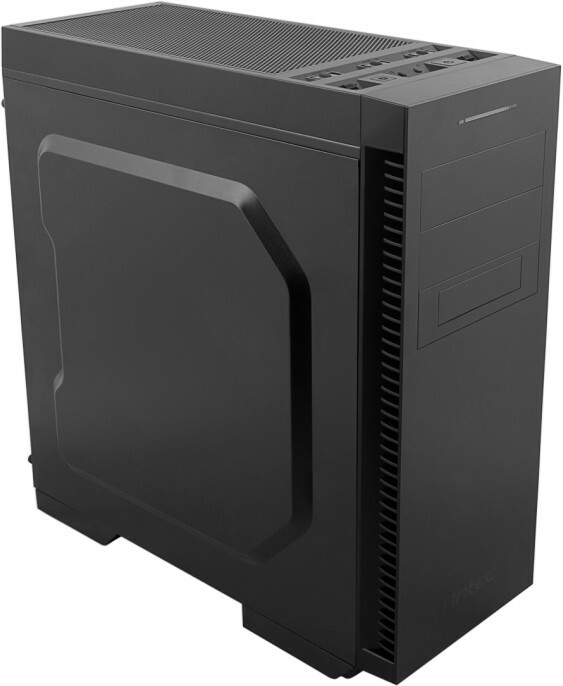 The Antec P70 is a mid-tower chassis designed to host ATX, mATX, and mini-ITX systems. Aesthetically it is monolithic, with just a bulge on each side panel and vents on the top panel to embellish its styling. Overall, it cuts a clean profile. Perhaps the most interesting detail on the front of the chassis is the long LED slit near the top. This lights up when you turn on your PC. This shot highlights the big bulge on the left side panel, which is mirrored on the other side, and the long array of vents at the front of the chassis. These vents are the primary intake openings for the chassis. The P70 can host a pair of 120mm fans up front, although there are no fans installed here out of the box. The rear of the P70 is fairly conventional. The most noteworthy details are the now-standard bottom-mounted PSU location (as an aside, Antec was, along with Lian Li, one of the first chassis manufacturers to feature bottom-mounted PSUs with its now-iconic P180), seven PCI expansion slots, and lots of vents. The expansion slot covers, incidentally, are the knock-out type. Notice, too, the pair of grommets covering tubing pass-throughs for an externally-mounted radiator as well as a 120mm fan mount for rear exhaust duties. The P70’s most interesting exterior details reside in the top section of the chassis. First is the I/O cluster at the front edge of the top panel. The presentation of buttons, ports and switches is symmetrical and stylish. The power and reset buttons sit in raised square sections; these flank the 3.5mm headphone out/mic in jacks, which Antec have covered up with rubber stops out of the box. To the outside of both the power and reset buttons are two USB 3.0 ports, also covered up with rubber stops. These protective rubber stops are interesting and it’s an original concept by Antec, as far as I know. Behind these buttons and ports is a trio of three-position fan control switches. Hooking fans up to these will enable you to set your fan speeds to high or low, or turn them off completely. By default, the P70 has the two top 120mm fans and the rear exhaust fan hooked up to these fan control switches. The P70 has an optional cover panel you can install at the top of the chassis if ultimate silence is your build’s top priority. Since this panel covers up the top-mounted fans, relocating the fans to the front is a logical countermeasure in case you do want to use the top cover panel. There’s nothing special on the P70’s underside. The removable dust filter covering the PSU vent and the four long and wide feet are the only noteworthy details here. Moving on to a view of the P70’s interior, we see that this Antec design is a mix of modern and ancient chassis concepts. The modern touches include the cable management openings, the CPU cooler cutout on the motherboard tray, and a tool-less optical drive retention system. Heck, you can even count the all-black treatment as a modern touch. Balancing these out as bygones of an older chassis design era are a permanently-mounted storage drive cage, an alarming shortage of space between the rear of the motherboard tray and the side panel (I’ll show a photo of this later) as well as fan mounts that make radiator installation impossible except at the rear exhaust position. The fact that you can only mount 120mm fans to the chassis is also somewhat anachronistic. 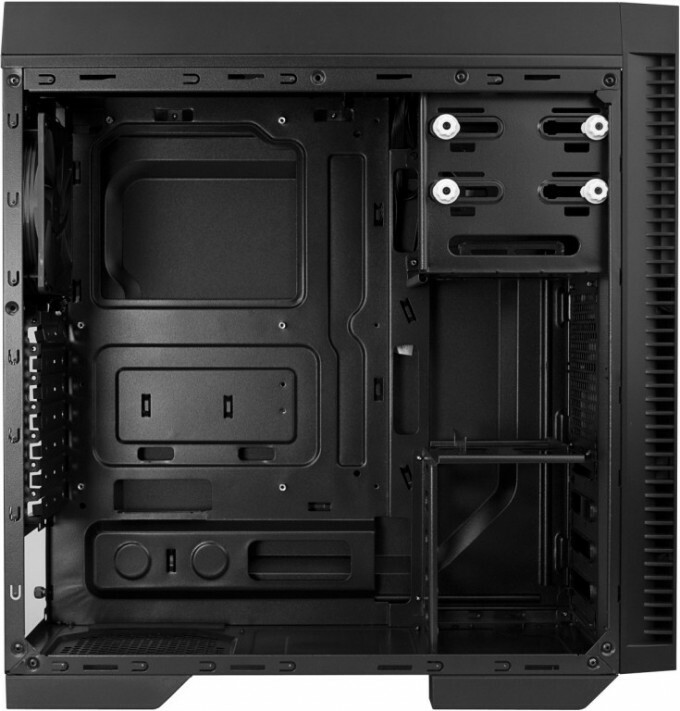 Finally, there is also a worrisome lack of depth and height inside this chassis, which may impact systems that use tower-style CPU coolers. Keen Techgage readers will be reminded that I ran into a similar issue in a previous chassis review. Antec includes two types of drive rails for 3.5″ HDDs, a pad of rubber grommets for the drive rails, a full complement of screws for system assembly, a PC case speaker, and a few twist-ties in a white accessories box. There is also a product overview pamphlet, a parts list, and a warranty pamphlet. Now that we’ve had our visual tour of the Antec P70, let’s install our test system into it and run it through our tests and evaluations. I’ll be reviewing the Antec P70 on a few key criteria: Ease of system installation; cooling performance; a subjective evaluation of its noise output characteristics; and a few miscellaneous subjective observations and comments about the chassis and its design and features. Before proceeding, here’s a look at our test system. Observant Techgage readers might notice a few changes with the test system’s configuration. The test chassis necessitated these changes. Before I installed the test system into the P70, I gave it a good look. My pre-build recon revealed that there actually is only one place in the chassis to mount the test system GPU’s radiator: the rear exhaust fan position. Unfortunately, there are several problems with this. First, the test system as configured actually will need the rear fan to exhaust the hot air from inside the chassis. Second, the AIO cooler’s tubing simply cannot bend correctly and safely if mounted at that position. The tubing will either kink or will foul one of the test system’s CPU cooling fans. Consequently, I decided to not use the GTX 680 in this chassis test. I could have reassembled the stock cooling for the GPU, but given the fact that I’d have to reinstall the AIO cooling set-up for future chassis reviews (I’ll be jumping straight into another one after I’m done with the P70) I decided it simply wasn’t worth the hassle. A third problem presents itself when you consider that some systems might require more than one radiator. What if your system has AIO coolers for both its CPU and its GPU? Finally, even if your system only requires one radiator, this chassis can only accommodate one thin 120mm radiator. This serious limitation in radiator mounting options is an ominous black mark right at the onset for this Antec. Installing the test system into the P70 was frustrating. The lack of space inside the chassis is but one of its problems. It shouldn’t be difficult to manipulate a screwdriver when you’re installing a motherboard, but given the P70’s tight quarters, unless you have a driver with a long handle, you’re likely to bash your hands all over. You (hopefully) won’t get cut and bleed all over the mainboard, but you’ll probably curse the chassis and its designers. I don’t have particularly large hands, but the P70 made me wish I wasn’t built like a fullback. Another problem is the disappointing build quality. Specifically, one of the standoffs got cross-threaded while I was screwing it into its position on the motherboard tray. Funnily enough, six of the standoffs were pre-installed into the P70; the three on the right for an ATX motherboard did not come pre-installed. I could probably overlook not having all the standoffs pre-installed, but to have a badly-tapped standoff hole that would cause a stripped standoff is just aggravating. And before I register yet another complaint about the P70’s interior, here is a photo of the test system installed in it. This shot shows another one of my big complaints about the P70: It’s nigh impossible to do a proper job at cable management inside this thing. It’s not just the lack of space inside; it’s also a matter of how the available space is distributed. The following photo illustrates this point. I mentioned the lack of space behind the motherboard tray earlier. The gap between the motherboard tray and the side panel’s inside edge is a scant 3/4″ at best, and a ridiculous 1/4″ at worst (there are concave sections on this side of the motherboard tray which widen the gap somewhat). I know there is a bulge on the side panel, and I’m pretty sure Antec designed that bulge to help mitigate against that tiny gap. Having that bulge there doesn’t really help much in practice. I literally had to rebuild the test system three times just to be able to close up the side panel, with the solution being simply not using the back side of the motherboard tray for any power supply cables. Consequently, you see a bundle of cables taking residence just in front of the power supply. Also, because I didn’t couldn’t have any power cables on the rear of the motherboard tray, I had to route the 8-pin CPU power cable on top of the motherboard. Now I know I could have used a PSU with modular cables, but I chose to use my non-modular PSU to make a point about this chassis’ ridiculous lack of interior room. At least I didn’t have to swap CPU coolers. The Havik 140 just fit inside due to the bulge on the left side panel. The list of niggles doesn’t end there, unfortunately. You can only mount one SSD in the P70 sans case mods; the SSD sits on its spot on top of the hard drive cage, secured on one side by a pair of extruded metal “clips” (nothing more than bent metal pieces that fit inside the holes on one side of the SSD) and by a pair of screws on the other side. It’s a very crude retention system. I’d rather have my 2.5″ drive secured completely by screws than the kludge solution Antec provides. The drive cage is exclusively for 3.5″ HDDs; its drive rail system was modern about ten years ago, but really is junk now. I mean, users want to have the option to install 2.5″ storage devices in the hard drive cages too. Can’t really do it with the P70. To be perfectly honest, I don’t want to keep on talking about the P70’s big issues, so let’s switch tracks and see how it does in the thermal performance phase of our review. Per usual, I’ll use OCCT to generate maximum CPU temperatures, as well as keeping the room ambient temperature at 72°F/22.2°C. Also per usual, I will test the P70 without any additional fans fitted to it. However, because there is no discrete GPU in the test system, we’ll skip the GPU maximum temperature test. The Antec P70 performed very well, registering CPU peak temperatures of 48°/49°/49°/49° C from the i5-2500k’s four cores. That performance makes the P70 the best among all PC chassis I’ve tested thus far for Techgage. How do we explain this performance? Honestly I’m a bit mystified, but here are some details that might point to possible answers. First, the P70 was tested with all three of its fans on “High” via the trio of fan speed switches on the I/O cluster. Second, all three fans were set to exhaust; that’s how they were configured by Antec. This suggests that the absence of fans in the front intake positions don’t hurt this chassis’ thermal performance at all. Third, all three fans are in very close proximity to the CPU socket. Perhaps this very small distance accelerates thermal dispersal. Whatever the reason, Antec has done a great job at ensuring the P70 can cool your system. Color me impressed. HUGELY impressed, even. Another impressive thing about the P70 is how it keeps your system quiet. Even without any sound insulation in the side panels, and even with all three fans on at high speed, I couldn’t hear the test system at all. Well done, Antec. In terms of overall build quality, though, well, I’m less than impressed. I already mentioned the cross-threaded standoff; another indication of sub-par build quality is in the thinness of some of the P70’s panels. Specifically, the PCI expansion slot area bends far too easily; the same can be said of the side panels. In fact, putting the P70 on its side with its side panels on is a terrible idea. The bulges on those panels will cave in, as I found out to my chagrin. You can massage them back into shape, but good-quality side panels wouldn’t be vulnerable to such damage in the first place. In contrast, the plastics used in the I/O cluster and the front panel are very good indeed. Antec used to be a bona fide giant in the PC chassis market, with a penchant for innovation, performance, and quality. Somewhere along the way, though, it lost some of the sheen from this fine reputation. Consequently, its position as a market leader has been usurped not just by one competitor, but a whole slew of them. The P70 – moreover, what the P70 represents – illustrates why Antec’s name isn’t covered in as much glory as it used to. It’s a mixed bag of excellent performance and good style balanced by some questionable (at best) design priorities and sub-par build quality. I still can’t quite believe how well the P70 performed in our CPU thermal tests, and I’m properly impressed by the silence with which this chassis does its work. I quite like the simple monolithic style, too. Unfortunately, I’m not sure if these pluses outweigh the P70’s minuses. I hate to say it, but building a PC into this chassis was a miserable experience. I’ve never had to rebuild a system thrice just to be able to close the side panels properly, for one thing. I don’t remember the last time a standoff got stripped during installation, either. I’ve seen really bendable (read: easy to dent) side panels before, but usually they’re made of aluminum. Heck, I’ve owned chassis with aluminum side panels that don’t get dented at all! It’s also the worst “modern” chassis I’ve seen as far as cable management is concerned. The overall impression the P70 leaves me with is that it’s an old woman dressed up in a tight mini-skirt dress. It’s trying too hard to look modern and forgetting how old it really is inside. The automotive equivalent is Pontiac Fiero-based kit car with bodywork that makes it look like it’s a supercar (here’s a link for those of you who missed that reference). How else would you explain such a small gap between the motherboard tray and the side panel in this day and age, or having cable management openings in the motherboard tray that are basically useless because of that tiny space available? And what about the near-total incompatibility with radiators? Here’s the problem: What if you want to upgrade your PC yet keep the same chassis? What if you want to get into water-cooling? These flaws are simply unforgivable for a modern PC chassis, in my opinion. Antec prices it P70 at $69.99; online vendors have gone as low as $59.99 for it, as far as I have seen. Honestly, though, it’s hard to recommend it even for budget-conscious buyers because of its very serious shortcomings. Not even its frankly astonishing performance in the maximum CPU temperature tests is enough to sway me otherwise. Affordable (as low as $59.99). Ancient design in detail (virtually no gap between motherboard tray and side panel; not water-cooling friendly; stone-age drive retention systems). Flimsy in parts – side panel, PCI expansion slot area.